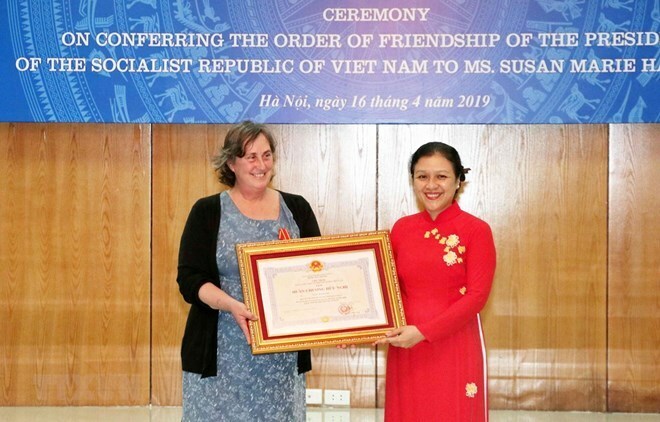 President of the Vietnam Union of Friendship Organisatoins Nguyen Phuong Nga on April 16 presented the Friendship Order, a notable distinction of the Vietnamese State, to Executive Director of the War Legacies Project Susan Marie Hammond. President of the Vietnam Union of Friendship Organisatoins (VUFO) Nguyen Phuong Nga (R) presents the Friendship Order to Susan Marie Hammond. Speaking at the ceremony, Nga said that this is one of the highest decorations that the Vietnamese state presents to individuals and organisations who have made significant contributions to the friendship between Vietnam and countries worldwide. In the past 20 years, Hammond has worked unceasingly to support Agent Orange/dioxin victims in Vietnam through a wide range of projects, which are funded by US veterans and their families to heal the wounds of war, she stressed, hoping that Hammond and WLP will continue their support for Vietnam in the future. The VUFO committed to accompanying Hammond, WLP and other foreign non-governmental organisations (NGOs) to develop the cooperative ties and friendship between Vietnam and countries across the five continents, she added. Hammond, for her part, said that she was determined to make concerted efforts to raise public awareness of the long-lasting impacts of this toxic chemical, as well as look for resources to endorse Vietnamese Agent Orange victims since her first visit to the Southeast Asian country in 1991. She expressed her great pride to receive the order and hoped to successfully carry out her projects in Vietnam over the next 25 years. Susan Hammond is the daughter of a US war veteran who fought in Vietnam. She founded the WLP, a Vermont based-organisation that provides comprehensive support for families that were heavily affected during the war against the US. As Deputy Director of the Fund for Reconciliation and Development during 1996-2007, she was responsible for enhancing Vietnam-US relations, promoting people-to-people exchanges, and encouraging US NGOs and universities to branch out support programmes for Vietnam.